DuPont Fabros Technology is entering the colocation market. The company, which has operated as a "wholesale" provider selling large suites of finished data center space, will begin selling space by the cabinet in the next few months. 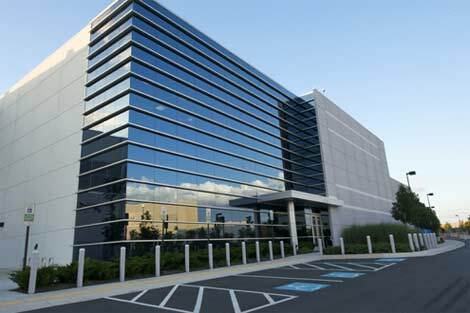 The ACC5 data center, one of the northern Virginia properties operated by DuPont Fabros Technology. DuPont Fabros Technology is entering the colocation market. The company, which has operated as a "wholesale" provider selling large suites of finished data center space, will begin selling space by the cabinet in the next few months. DuPont Fabros (DFT) made the announcement in its earnings call last Thursday. DuPont Fabros will start small, dedicating about 800 kilowatts of capacity in its data centers in northern Virginia and New Jersey to colocation space. This will represent a beachhead for what could become a larger colocation business in the future, said President and CEO Hossein Fateh. The move reflects the growing competition in the market for outsourced data center space, which has led both wholesale players and "retail" colocation providers to expand their service offerings. In colocation, a customer leases a smaller chunk of space within a data center, usually in a caged-off area or within a cabinet or rack. In the wholesale data center model, a tenant leases a dedicated, fully-built data center space. DFT's entry into colo is enabled by the emergence of the Open-IX movement, which has led two European Internet exchange operators to launch local peering hubs in the company's facilities. The London Internet Exchange (LiNX) has taken space in DuPont Fabros' ACC5 data center in Ashburn, while Amsterdam's AMS-IX will open a Open-IX exchange in the NJ1 data center in Piscataway, N.J. The presence of these Internet exchanges will allow colocation customers to easily access a wide range of networks, instead of having to arrange their own connectivity. "We believe this is a good opportunity to step into a cabinet-based offer, where customers can lease one or more cabinet, connect to fiber provider of their choice and to one of the Open-IX switches and subscribe to our Level 1 IT support, should they need assistance," Fateh said on the earnings call. "This initial launch will allow us time to build out the infrastructure needed to support a robust retail product, while taking a prudent approach into this offer. We expect to have our cabinet-based offering on the market in the second quarter of this year." Services offered to colo customers will include "rack and stack" installations, server reboots, shipping and handling of equipment, network cross connects and cabling. "It's going to be a very small operation," said Fateh. "In Virginia, we're talking less than 40 racks. We're hiring a couple of people to do this, but at the moment, we don't envision it to be a large part of our business at all." But that may not always be the case. In 2017 through 2019, DuPont Fabros will have up to 13.8 megawatts of leases coming up for renewal in its ACC4 data center in Ashburn. "We want to be really ready for a retail product so that when and if some of those lease has come up in ACC4, we'll be able to re-lease some of that" as colocation space, Fateh said. Shifting to a colo model would produce a better return than leasing that space to "super wholesale" customers, who have large requirements but can often negotiate for attractive lease rates.